After the IDF’s intelligence unit, Aman, came up with the bright idea to create a special unit to investigate, monitor and spy on Diaspora groups opposed to the Occupation (enemies now known by the catchy phrase, “delegitimizers”), I thought the only proper response was to step up proudly and say: “I am one.” Not a delegitimizer in the terms they employ since they falsely claim that delegitimizers wish Israel’s destruction. That’s not the kind of delegitimizer I am. I delegitimze Occupation as do all the groups they’ll be harrassing. So Michael Levin and I came up with this poster which we hope you will share, promote, circulate via social media, etc. Let’s tell the generals, spooks, inquisitors and ideologues that we want to be first on the list to be investigated. 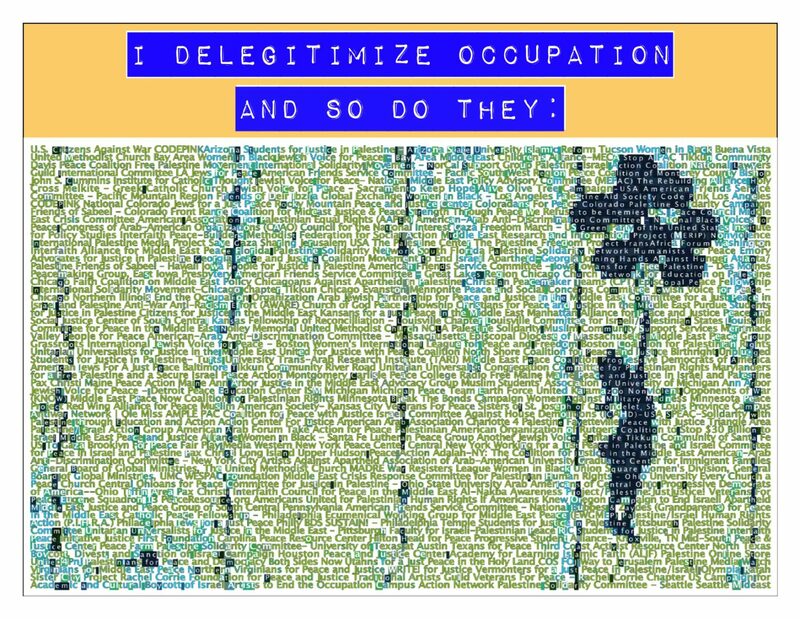 I delegitimize Occupation. There. Now I said it. I feel better already. Now when can I be expecting that knock on the door in the middle of the night from someone from headquarters saying they just have a few questions? Beautiful graphic and (I suppose) quite a comprehensive list of organizations. To the IOF: I demand to be listed. On Silverstein’s precise terms. RS: I’d add “SEARCH for Justice and Equality in Palestine/Israel” to your list. It “flourished” in 1980-1990 or thereabouts, led by the energetic (now late) Ned Hanauer. Love it! And thanks for including the Arab Jewish Partnership! RE: “I delegitimize Occupation.” – R.S. Beautiful! Couldn’t find Free Gaza Movement, but maybe it’s hiding in there somewhere. Meantime I’m covered by ISM and Women in Black-Los Angeles. My organisation is on there! 😀 I wasn’t expecting to see it, as we’re nowhere nearly as well known as the big groups like Women in Black and ISM. I’m going to print off the graphic and show it to the women in our creative arts group, to see if they want to make a banner version for the wall. If they do it I will send you the photo, Richard. Technically I would disagree – this would only be true if there was something “legitimate” about the Occupation in the first place, which there isn’t. Rather, you are recognizing an already-illegitimate situation (I use this language in the same sense that the U.S. Constitution recognizes rights that you already have courtesy of Natural Law). was in response to the Jordanian shelling of the populous narrow costal area of Israel between the Jordanian west bank and the mediterranean sea on June 5,1967 and King Hussein’s subsequent refusal to cease hostilities despite Israel telling him that she did not want war with Jordan. Ha kam le-or-ge-kha askm le-orgo. He who rises to kill you,get up earlier to kill him. First, we don’t accept the settler narrative either in language or hasbara. No reference to the extremist terms you’ve used. The correct usage recognized by the world & most Israelis is the Occupied Territories. I simply will not allow settler propaganda to be disseminated here & their terms are part of this hasbara. Israel’s Occupation was the result of Israel’s pre-emptive attack on Egypt. Israel has had scores of opportunities to negotiate the return of the settlements after the war & refused at every opportunity. I’ve also dealt with yr inapt reference to the Talmudic dictum allowing murder of an enemy. Do not bring this completely irrelevant hasbarist nonsense up here again as it’s been discussed & roundly rebutted. This teaching was only meant to refer to an individual and not to a nation. Also, there is ample historical evidence that no war need have broken out in 1967 until Israel destroyed the Egyptian air force. Whether or not Israel wanted a war before June, 1967, by that date it decided it did want war and was convinced it could win through starting the war first. Aside from Nasser’s bellicose verbal threats, there is no solid evidence that he intended or was prepared for war. Therefore, once again the teaching is off point, way off point. Judaism is the problem. Zionism is just fine thank you very much. Zionism was doing fine when it was atheist. The more judaism is injected into it, the more things go to hell. Starting with the 1929 attempt to threaten muslim sovereignty over the temple mount. The words that Jews have called those area from the start of human history is: Judea and Samaria. What next ? You will not allow to use the term Jerusalem, only El-Kuds ? If you want to ban me cause I say the words, please do. I will be honored. You can claim they are held illegaly by Israel. You can claim many things, but you cannot deny those terms however hard you try. Don’t addopt the 1984 talk. I think that’s extreme. I think & hope you mean the “Judaism” practiced by the settlers & their ultra Orthodox supporters, which isn’t Judaism as I know it. The words that Jews have called those area from the start of human history is: Judea and Samaria. Bull. What does such a grandiose, empty phrase like “the start of human history” mean anyway? Jews didn’t exist at the start of human history & there certainly was no such thing as Judea or Samaria at the start of human history. Jews in the ancient past used such terms to describe the entire Kingdom of Israel, not the Occupied Territories. The use of the term to refer specifically to the territory conquered by Israel in the 1967 war is a relatively recent and entirely propagandistic phenomenon professed by settlers & their supporters. You won’t use it here. I will allow terms that are commonly accepted in usage by people in the world such as Jerusalem, Israel, Palestine, Occupied Territories, etc. But not those 2 terms. I mean judaism as I know it, which is maybe a little bit less severe than the settler version. I really can’t imagine what’s left of judaism when you take out the racism. Prehaps some kind of “tradition” – I don’t see the point of it. free man, can you imagine that human history may have started even before Jews started to call those areas Judea and Samaria? Ever heard of Canaanite and Amorite civilization? Ever heard that Jericho, Hebron, Lachish, Jerusalem, Nablus, Megiddo, etc. existed long before the Israelite conquest of Canaan? To a historian, your exclusive claim on these lands and names sounds ridiculous at best. You can call places what you want, but the rest of the world outside Israel uses the terms West Bank, Palestine, Occupied Territories, Nablus, etc. How can you write “we do have a right for a state” and at the same time be a One-Stater ? From a Palestinian point of view, it’s definitely (political) Zionism and NOT Judaism (per se) that causes a problem. By the way, I often think the best solution would be two states: one for ‘average’ Palestinians and Israelis, and another for the religious nutcases on both sides. They could get the Negev – except Dimona – and I’m sure these Jewish and Muslims Talibans will get along just fine. I fully support your solution to the conflict. Maybe we should call it “southern Levant”. In any case, names are just names, and the region has many of them. For me, Land of Israel is just as valid as Palestine, Judea & Samaria, Levant, or whatever name someone will come up with next. I looked in the index of a world atlas, but there was no listing for “Occupied Territories”. However, I found a Christian bible that referred to “Judea”. It didn’t refer to “Occupied territories”. Wow, a Christian Bible translated the ancient Hebrew term Yehudah into “Judea.” That’s impressive. Meaning what in terms of contemporary usage? Efes, gornisht, zip,nada. What attempt to threaten Muslim soverignty over the temple mount? Jews praying at the WESTERN WALL were attacked and some were murdered in 1929. Are the revisionists now trying to manufacture an excuse for this massacre? And what is meant my “Muslim sovereingty over the temple mount?” How can Muslims have sovereingty over a site that was holy to Jews 1600 years before the birth of Mohamed? Nasser had set up gun emplacements in Sharm el-Sheikh and threatened to sink any Israeli (or Israeli-bound) vessel attemting to pass through the Straits of Tiran. The USA tried to put together an international convoy to accompany Israeli vessles through the Straits. This would have put Nasser in the position of having to fire upon other ships if he wanted to attack Israeli ships – but also have provided him with a means of backing down without losing face. However only two of the six other nmations requested by the US agreed to join the convoy so the plan was dropped. At the time the Straits were Israel’s oil import route and Israel only had three weeks reserve supply of oil. Furthermore, although Nasser had only two divisions on Israel’s border, he had another seven in transit across Sinai approaching the Israeli border. That was why the Israelis had to act when they did. Sorry, I meant SAVE face. Hasbara buddy & WAY off topic, a major comment rule violation. We’re not refighting the 1967 War here. If that’s your intent go find a forum that deals with military strategy and war fighting. This is SO far off topic. Stay ON TOPIC.